I’ll be devising and performing original music and foley with percussionist Stephen Hiscock for this live reimagining of this British science fiction masterpiece. 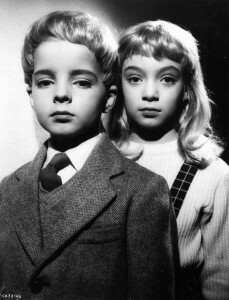 The inspiration for cult film The Village of the Damned (1960), for one night only John Wyndham’s sci fi novel The Midwich Cuckoos will be performed on stage by actors, as though in a live radio play. As the story unfolds, Spacedog musicians Sarah Angliss and Stephen Hiscock use theremin, modular synth, robotic instruments, live percussion and foley to conjure the uneasy atmosphere of Midwich, a village whose fate is sealed during a mysterious blackout when every living is rendered unconscious by an unknown force. On re-awakening, all the women of child-bearing age are pregnant. They later give birth to a dozen identical, blond-haired children with eerie intellectual and telepathic powers. The Midwich Cuckoos Live has been created by Cinecity Brighton, in partnership with Film Archive South East and the BFI, as part of the BFI’s season Sci Fi – Days of Wonder.